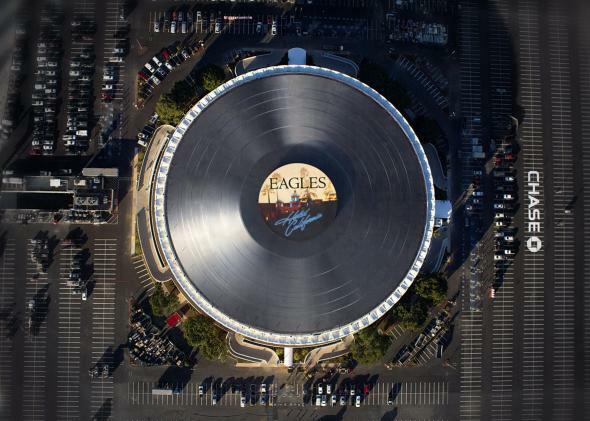 The biggest LP ever takes up the roof of a building and is a copy of Hotel California by the Eagles. The diameter of the enormous LP on the roof of the Forum is 407 feet. The vinyl resurgence is getting a little intense. First it was LPs at Whole Foods, but now the Forum in Los Angeles, formerly the 30-year home of the Lakers, has created the biggest record ever. And, yeah, it’s pretty huge. The Madison Square Garden Co. purchased the Forum in 2012 and did a major renovation to revive it as a concert venue. It opens on Wednesday, kicking off with a five-concert series by the Eagles. And if you’re trying to do some venue promotion, there’s nothing like putting a 25-ton, 130,000-square foot spinning record on your roof. The Forum is just a few miles from Los Angeles International Airport, so passengers flying in and out can see the record from the air. (It’s visible from a mile up.) It’s made of 250,000 square feet of vinyl and 15,000 LEDs. It took 13 engineers a month to design it and draft the drawings, and then it took two weeks to build. The record spins at 17 miles per hour and is wind-resistant up to 80 miles per hour. Basically, this thing is a beast. The only disappointing part is that the huge LP doesn’t seem to do an important thing records usually do: play music. The vinyl is printed and has a label, but there’s no enormous player to go along with it. Beats by Dre should get in on this.